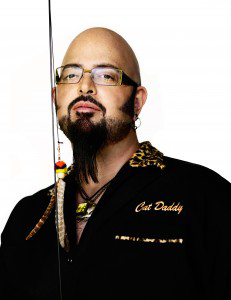 A Tonk's Tail... err, Tale...: Jackson Galaxy: your questions, answered! 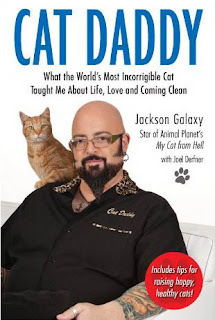 Last Thursday, Jackson Galaxy's book, "Cat Daddy" hit bookstores and cat lovers all over are raving about it. We had a chance to talk to Jackson about his book and posted that review on Release Day - May 10. 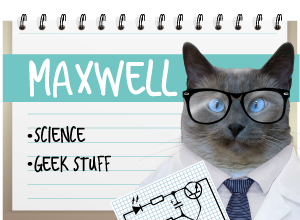 As promised, I shared your questions with Jackson when we talked. Here, now, are his answers. Jackson begins to tell me the story of a little girl. Her dad brought her up to meet Jackson after his first public appearance. The dad nudges his daughter. 'She has something to tell you,' he says. “All I care about is that there’s another generation. All I care about is that we have set something up here so that we never have to slide back to killing 12 million animals a year because we have – all of us over all these years – have changed the culture. From Carolyn & Austin: "Who painted his arms?" When Sebastian's mom over at Sebastian the Sensitive Soul interviewed him, she discovered that some of his arm tattoos (we hear they're called "sleeves" - and don't we kitties sound all hip and cool?) were inked in the Denver area, where so much of the book "Cat Daddy" took place. 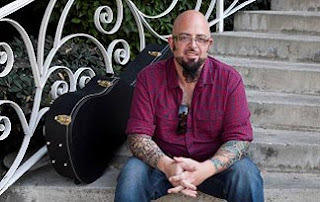 From The Island Cats: "We wanna know if Jackson Galaxy is his real name. ;-) "
We can tell you this: when Jackson calls you, caller ID lights up with "Galaxy, Jackson"! The last two questions? Well, those are easy. Guys, it’s all there, right in the book. No spoilers, sorry. But we can tell you, it’s well worth the read. 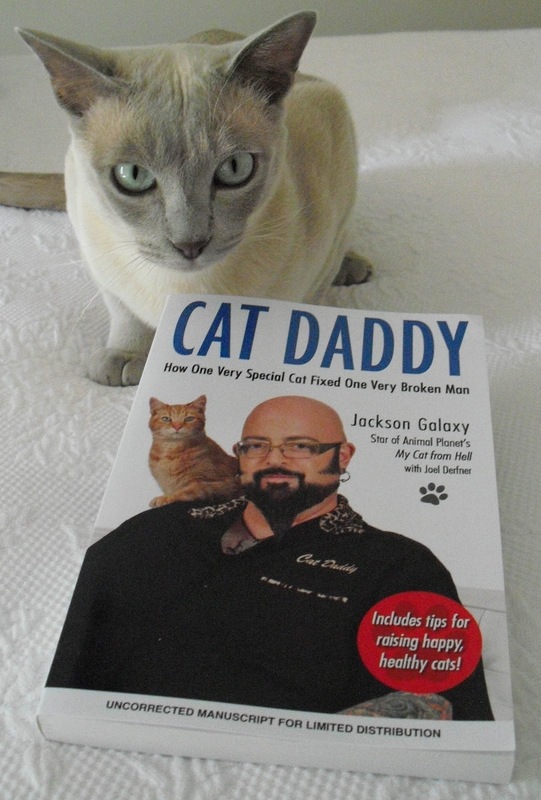 And if you’re planning on picking up “Cat Daddy” please, be sure to do so as soon as possible. Any author will tell you, those critical first days can often determine a book's success, and whether the author gets renewed by the publisher for any future books. So if you plan to buy, please - buy now! This book is a work of non-fiction published by Tarcher/Penguin, and contains moderate profanity. I was given a copy of this book to review by the publisher free of charge, but all opinions in this review are my own. 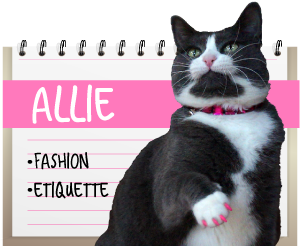 "Two paws up - waaay up!" good questions....ours was ordered and maybe some day soon the man in blue shorts will deliver it!! Isn't Jackson a totally awesome human! We wonder if they have the book here...we'll get Mommy to check. Otherwise, we might have to steal her credit card and place the order with Amazon! Good questions and answers ! I think it's amazing that cats have such power, the power to turn around a life. Jackson is amazing. 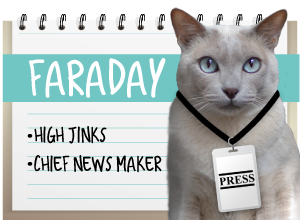 Oh, and Mum says "Do we get a free Faraday with the book" MOL!!!!! Great questions....and answers!! Our mom has to get that book!! Nice book and I will ask the Human to buy it for me, but honestly? Faraday, you are so handsome and gloriously good looking that my Human is making a fool of herself cooing at the screen. It's kind of scaring me, really. I would love to have the Cat Daddy book.I love watching MY CAT FROM HELL when its on I just love what he does for the cats and their humans.I have a cat shes 6 months old and she looks like a leopard but shes very powerful her name is Sox. What should I do about her? Not sure what you mean? If Sox is a 6 month old powerful kitty, is this a bad thing?